Jeremiah Toller is an award-winning, international photographer based in Phoenix, Arizona. Academically trained in photography at Scottsdale Community college, Toller became a regular freelance shooter for The Arizona Republic/AZCentral.com, Arizona's largest newspaper, in 2007. Artistically creative and flexible, Toller specializes in photojournalism, editorial and advocacy photos, and portraiture. He enjoys making fine art images when his schedule permits, a pasttime which earned him the 2009 People's Choice Winner - Ultimate Creativity Photo Competition. 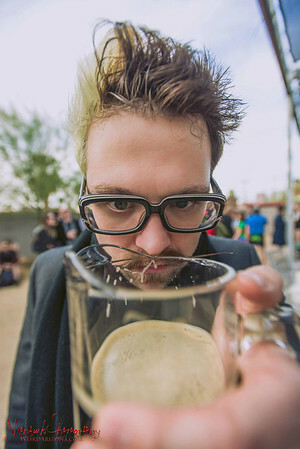 He has since worked regularly for such publications as The Phoenix NewTimes and NightFuse.com, among others, while continuing with The Republic, and has photographed more than 2,000 events under a variety of conditions. He was named Best Nightlife Photographer by the Arizona Nightlife Industry Association. "I have photographed a lot of extraordinary affairs from mild to wild, grotesque to risqué, so there's not a whole lot that shocks or offends me these days," says Toller. Such events frequently require a great deal of skill due to adverse lighting and space conditions, as well as good judgment and "people skills." "My ultimate aim as a photographer is to guide my work in a direction where I can use my skills to make a positive contribution to the world by creating visual content that raises awareness for causes that I feel are important, " he says. In a digital world full of would-be photographers, Toller's training, his experience with shooting under a variety of conditions, his artistry and philosophical depth juxtaposed with the realities of producing top-quality images, make him a sought-after professional. 2012 Awarded title of "Arizona's Best Nightlife Photographer" by the Arizona Nightlife Industry Association. Every job has different requirements and, therefore, needs a unique pricing quote. Usually, prices start at $350 for non-commercial use. We do our best to work within a client’s budget, so please include your offer along with details of your needs when contacting us. Wedding packages start at $2,000, which includes Toller and another shooter for up to four hours at a Phoenix local venue, a web gallery to review, share and order prints (as well as other printed items such as canvases, calendars, mugs, shirts, etc.) of your proofs and a 20% discount code for any printed items you may order through your gallery.